The Karen National Union held an emergency meeting to try to re-energize current peace talks between Ethnic Armed Organisation and Burma’s government. KNU sources claim the peace talks have become bogged down since the much vaunted second 21st century Pang Long Peace Conference took place in May. 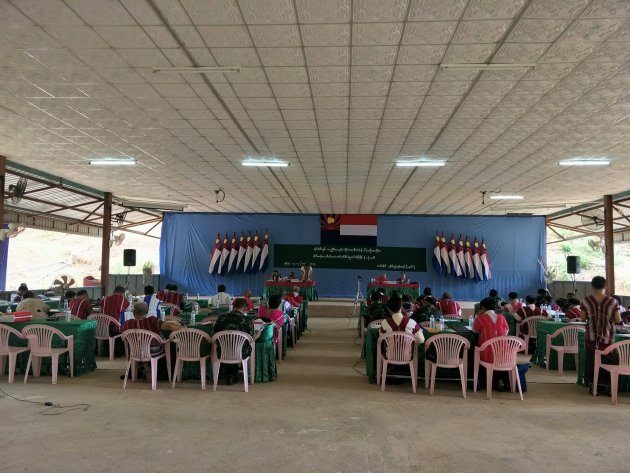 The Karen National Union Central Standing Committee held the emergency meeting on the 4th of October in Lay Wah Camp, the KNU’s Hpa-an district headquarters to look into ways to continue the peace process between the government and Ethnic Armed Organizations (EAOs) which has been stagnant. P’doh Saw Hla Tun, KNU the joint secretary said that the meeting was held to find ways to restart the peace process. KNU sources said the emergency meeting was held as there had not been any activity since the second 21st century Pang Long Peace Conference that took place from May 24 to May 29 between the government and ethnic armed organizations representatives. This emergency meeting included reports of the current political situation, peace process will be reevaluated and the opinions of the Central Standing Committee members on the peacemaking process will be received. The KNU signed the nationwide ceasefire agreement along with seven ethnic armed organizations in October 15, 2015. This KNU meeting was the first central standing committee emergency meeting since its 16th congress held on March, 2017. Most of the 55 central standing committee members attended the meeting except those who had health issues.